I've been writing about comics, games and other assorted nerditry for years. But, this week, I'll be attending my first-ever San Diego Comic-Con. Not only that, this Thursday is my birthday. That means I'm liable to get myself a present or two. Or five. Many of the publishers, toy companies and other geek purveyors who'll be at Comic-Con International this week will come to the annual nerd prom bearing one-of-a-kind editions of their wares that you can only get at the show. These kinds of things tend to be pricey but here's a few I think are worth the wallet-hurt. $100 is a lot for a graphic novel. Especially one I already have a copy of. But Daredevil's one of my favorite superheroes and Born Again pretty much amounts to a sacred text for me. I can quote whole pages by heart. (So can Owen Good.) Getting a look at the artistic process employed by master artist David Mazzuchelli as he brought one of Frank Miller's best stories to life is a must-buy for me. Darwyn Cooke's adaptations of Richard Stark's crime thrillers stand as exemplars of how creative works from one medium can actually gain energy when translated to a new medium. The plain ol' edition of this heist story is out this week but the gritty minimalism of this slipcased Con edition sums up everything I love about Cooke's work. I think that Scott Pilgrim is damn near perfectly realized in any medium in which it exists. The downloadable video game is a great, humorous homage to side-scrolling beat-em-ups of the past and Edgar Wright's feature film brilliantly uses video game magical realism as a metaphorical layer for what happens when we fall in love and realize things about ourselves. 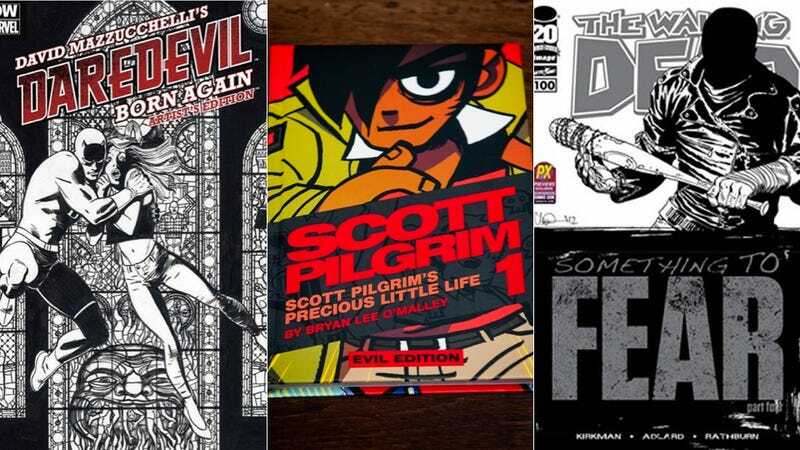 So, I might be dropping a wad of cash in honor of Bryan Lee O'Malley's series of genius graphic novels that started it all. Let's think about The Walking Dead for a second, now that Robert Kirkman's zombiepocalypse drama has hit a milestone. It's become a multimedia phenomenon with a hit TV show and two video game iterations being worked on. All of this success comes with no major marketing, driven purely by a passionate fanbase who appreciate the humanity Kirkman pumps into his work. Walking Dead embodies many multifaceted aspects of Con and nerd culture and I'll be grabbing this issue to celebrate that fact. I don't have to explain this one, do I? The Con exclusive version of this comes with a photo of "Cave" autographed by Valve employee Bill Fletcher, who was the model for the Aperture CEO. The best way to get something truly unique at Con? Get a sketch. Super-smart thinking by Boom! Comics to have a version of Adventure Time #1 ready to be graced with a awesome custom drawing.